Unlike flashier “super foods” we hear about daily, parsley and celery get no respect. Parsley is tossed on a steak plate as garnish. 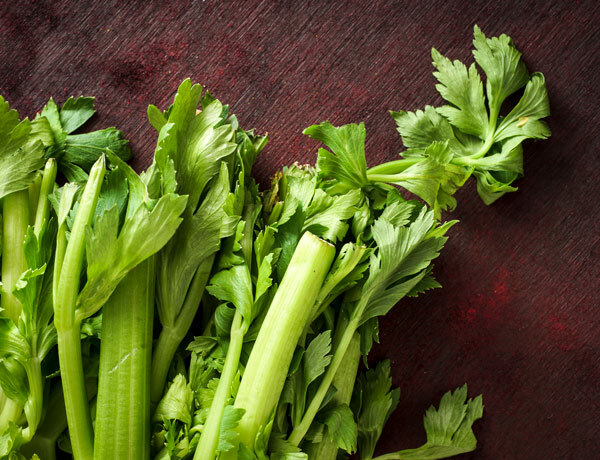 Celery is dunked in Bloody Mary drinks at the brunch table but not used in much else. It’s unfortunate these foods have a reputation as empty calories, because they contain a nutrient being studied for its ability to fight cancer. Preclinical research shows this nutrient, called apigenin, has anti-cancer activity against mesothelioma cancer cells. This shouldn’t be surprising: Many natural substances are shown to interrupt cancer cell development and spread. Over 50 percent of chemotherapy drugs come directly from plant substances or were developed in the lab by modifying a plant chemical into a drug. Apigenin is a plant nutrient researchers are studying for the treatment of mesothelioma. Supports the function of tumor-suppressor genes. Hinders gene activity known to promote cancer cell growth. Curbs new blood vessel development around cancer cells. Improves efficacy of chemotherapy drugs. Population studies in humans also suggest a connection between regularly eating apigenin-containing foods and reduced risk of several cancers. The Mediterranean diet, which is widely studied for its ability to reduce risk of chronic diseases, including cancer, is naturally full of foods containing the nutrient. An apigenin clinical trial at The Ohio State University is looking at potential health benefits of banana bread with celery for women at high risk of developing breast cancer. Decades of research support the cancer-preventive role plant foods play. A dietary pattern based around plants reduces cancer risk. You don’t need to be a vegetarian to benefit. All you need to do is fill around two-thirds of your plate with whole plant foods such as vegetables, fruit, nuts, beans and whole grains. Fill the rest with animal foods. Plants appear to reduce risk in part because of the phytonutrients they contain. “Phyto” means plant, so phytonutrient means nutrients found in plants. There are thousands of phytonutrients, including many familiar players, such as beta-carotene and chlorophyll, a substance found in all green plants, in the foods we eat. Apigenin is just one of many promising, cancer-fighting nutrients. Apigenin belongs to a family of food substances often touted as “cancer fighters,” which also includes nutrients found in red wine, green tea and dark chocolate. Parsley, chamomile tea and celery are excellent sources of apigenin and related nutrients. Other herbs — mint, oregano, thyme, cloves, lemon balm and sage — also contain it. Additional places you’ll find the nutrient include artichokes, onions, oranges, tea, spinach, rutabagas and lettuce. Foods containing apigenin are good additions to most diets. However, nearly all nutrients studied for anti-cancer activity can be good extras to an eating plan. Fill your plate with plants of all colors, shapes and flavors. Plants are powerful medicine but will not cure mesothelioma or any other cancer. Eating well during cancer treatment is important. Depending on personal circumstances, healthful eating can look different for different people. The most common nutritional problems for mesothelioma patients include consuming too little protein and too few calories. If you’re struggling to eat enough to maintain your weight, you can juice fresh fruits and vegetables to obtain nutrients without filling up. Don’t own a juicer? Toss some fruit or vegetables in a blender with water and then strain with a cheesecloth. Most grocery stores sell cheesecloth, which is inexpensive. If you are having trouble meeting protein and calorie needs, ask your doctor for a referral to a registered dietitian experienced in working with cancer patients. Suzanne Dixon is a registered dietitian, epidemiologist and experienced medical writer. She has volunteered with the National Cancer Policy Forum, Oncology Nutrition Dietetic Practice Group, American Institute for Cancer Research, American Society for Clinical Oncology, The National Academies of Sciences, Engineering, and Medicine. The New York Times and Time Magazine also have reviewed her cancer patient resources. Bhagwat, S. et al. (2013). USDA Database for the Flavonoid Content of Selected Foods, Release 3.1. American Institute for Cancer Research. (n.d.). Phytochemicals: The Cancer Fighters in Your Foods.